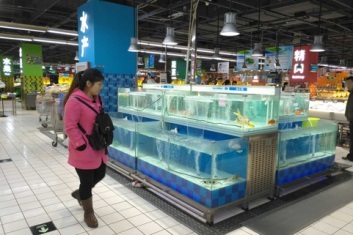 Numerous Beijing supermarkets suddenly emptied their fish tanks on Thursday, all at the same time; a move which is said to be linked to an information leak detailing imminent food safety inspections. 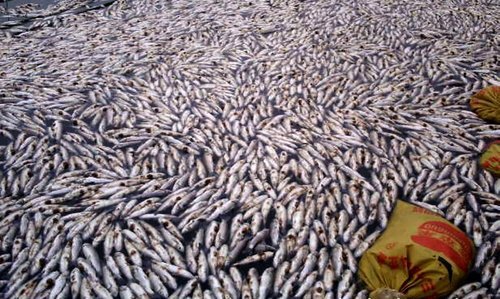 The China Food and Drug Administration (CFDA) on the same day announced publicly that they would be carrying out seafood investigations in 12 cities nationwide; although it’s reported that supermarkets in Beijing became aware before Thursday that they would be among those scrutinised. According to an anonymous source inside the CFDA, this prompted the emptying of the tanks. Beijing Youth Daily reporters carried out a survey of 20 supermarkets – including branches of big name chains like Walmart, Wumart, Yonghui and Carrefour. They found 16 to have zero fish stocks on Thursday; which is highly irregular. Shanghaiist beat everyone to the ‘sounds fishy’ pun; so we’ll have to settle for ‘seems a case of guilty consciences,’ followed immediately by a profound apology. Squidding aside, the matter is serious. 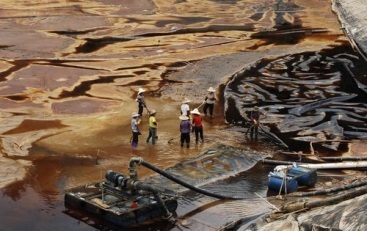 If, indeed, there is a link between the apparent leak and the emptying of the tanks, it may suggest the foods being sold to Beijing’s residents by some of its large, international supermarkets are unsafe. Then again, if the allegations are true, one might bear in mind what an anonymous CFDA source told Caixin: “supermarkets’ instinctive response to news of inspections is to pull stock off the shelves.” Indeed, such a move could be seen as a precautionary measure; albeit an underhanded one. In the shoes of a supermarket, there is lower risk in avoiding inspections than undergoing them, even if they probably would be passed. Still, that probably won’t make Beijing’s residents feel better about the situation. There is little reason, after all, to believe that many will take at face value the word of a government which has itself recently had to pay reparations to Zijinshan farmers for the poisoning of fish supplies following a toxic mine leak. Indeed, we might want to ask whether these empty tanks tell a deeper story than that of shady supermarket practices. To elaborate: what’s surprising here is that, according to Caxin, the CFDA’s official stance is that ‘the current situation is not caused by tainted fish.’ Well hold up. Shouldn’t they be saying the opposite? One might expect authorities to further scrutinise the supermarkets in the wake of these allegations; by launching an investigation, for example. Instead, they’re backing them up. Why? Consistently, it seems, the mantra of ‘all’s fair in economic growth’ (which seems the implied motto of many governments nowadays) doesn’t reassure people who are concerned about its effects upon human health. Hugh Campbell is one of many to have criticised ‘liberalised actions by large corporations and [the] abandonment of social responsibility by the state…[amid] the changing balance of power between actors in the agriculture and food sector.’ Basically, critics say that governments nowadays are often keen to make the practices of large corporations look fine, even though they might not be; because the businesses drive growth. The same critics also imply that people are getting wise to this; and understand that such practices are generally manifested in fairly everyday matters (like the sudden absence of fish from supermarkets one day). Such outlooks might indeed supplement the way in which we read the words of Caixin’s CFDA source: essentially, when they claim the leak shows how ‘our agency [the CFDA] has some difficulty in keeping things secret,’ we might be inclined to add ‘duh’ afterwards. * By the way, if anybody ever says this: “What’s the difference between a piano and a fish? You can’t tuna fish,” they’re speaking gibberish. Everybody knows you can “tuna fish”: it’s a phrase comprised of an adverb and a verb and it’s a certified activity covered thoroughly by Sport Fishing magazine week in, week out (which I read, avidly).